I come across these babies whilst browsing through my local express the other day and I could barely contain my drool. SOO Frickin Cute!! There is a new silhouette on the denim scene for 2011 and I could not be more excited to see this oldie but goodie make a comeback. 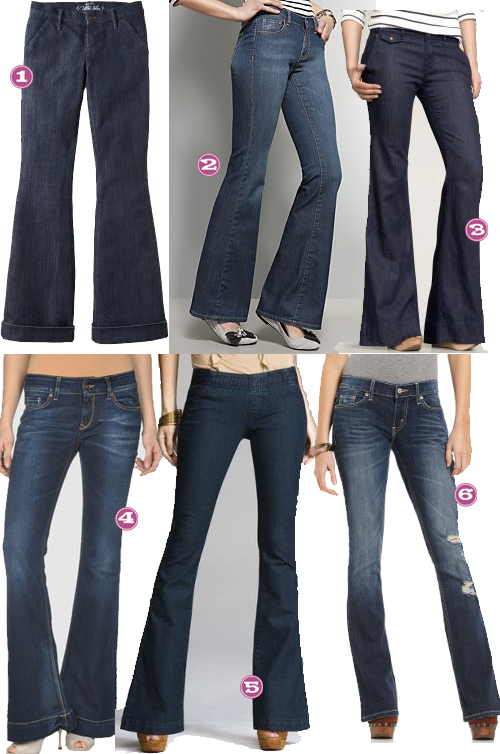 Flare leg jeans have a super 70’s vibe that I LOVE and to me they just fit on more body types than the last denim trend of the skinny variety. 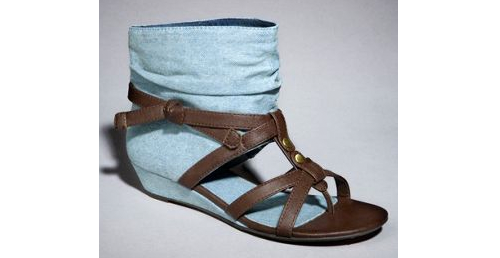 I can’t wait to slip on some of these with some platforms and big glasses while humming to the tune of Stayin’ Alive. Amazon, Modern Family Season 1– I can’t sing this show’s praises enough and I totally want to own this so I can re-watch it over and over. Nordstrom, Michael Kors Chronograph Watch– I haven’t owned an actual watch of value since I couldn’t tell you when. And I know there are much more pricey pieces available, but since I’ve been out of the game for a some time… I’ll start off easy. Express, Essential Stretch Military Shirt– I am a HUGE fan of the military trend and the stretch in this top would allow room for the ladies if ya know what I mean. Etsy, Finger Print Necklace– I would love to preserve and wear my new little man’s finger print around my neck daily. It’s such a unique keepsake that I would cherish forever. Amazon, Hobo International Metallic Lauren Wallet – I adore my hobo lauren wallet that I have, but it honestly has seen better days. I really like the metallic version for my upgrade. Amazon, Raspberry Converse– Since the purchase of my very first pair of converse, I am wanting to own every color of the rainbow and these are the perfect shade of pink. Kohls, Deni Digital Stainless Steel Steamer– Steamed veggies are where it’s at in my book, so I think this is right up my alley. Timi and Leslie, Baby Jane Bag– I LOVE my current diaper bag so much, but a gal can never have too many bags, right? I love the sleekness of this bag and I would totally rock this with or without my baby. 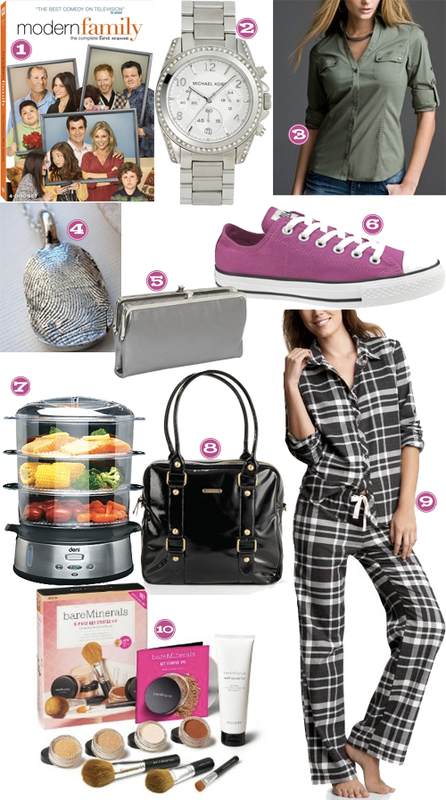 Gap, Plaid Flannel Pajamas– I have always wanted a classic set of jammies to kick it in during the winter months. Amazon, Bare Escentuals Starter Kit– I have always wanted to give this stuff a go. I have never used any type of mineral make-up before, but those infomercials sure do sell me. I know that term is highly over used, but it accurately depicts the man in my life. My husband, like many of his kind, takes longer than me on most occasions to get ready, likes shopping, cares about fashion and grooming almost as much as any woman I know and is extremely hard to shop for. 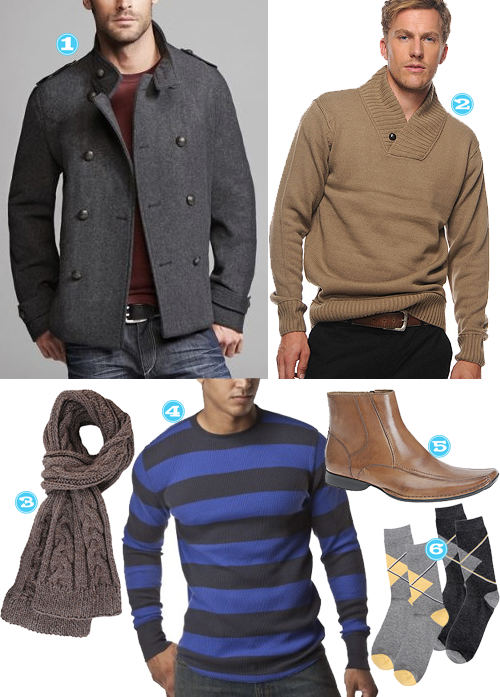 So, here is my best guesses for that metro man in anyone’s life this year. This is the last in our series of Pretty Things in the dress genre. 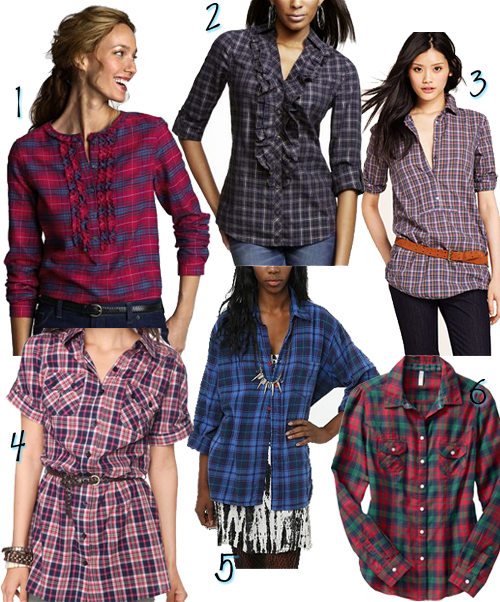 We are ending it with shirtdresses! Der-Women’s Belted Woven Dress-Here is one helluva a deal and a perfect fall wine color.. would be highly adorable with some tall boots. Of course when it’s not 106 degrees. Court-Speechless Women’s Striped Long Sleeve Shirtdress-So I don’t tend to gravitate towards the men’s work shirt dresses as much as I do the t-shirt dress look. Love the simplicity and the stripes of this dress and matches great with a set of leggings. AK-Bailey Blue Junior’s Military Long Sleeve Shirtdress-I love the neckline of this dress and I also love that it’s an empire waist! I’d definitely wear this with some chunky turquoise earrings. Sarah-Long Sleeve Military Shirtdress-This dress may be on the short side for you leggier ladies, but I think it’s totally adorable…add some tights or tall boots like Der and Court suggested and you’re ready for that transition from summer to fall! AK has written about her eternal struggle for the perfect tshirt and I’m no expert on what’s perfect, but the softness of these vintage-y, burn out type tees is something to be coveted.